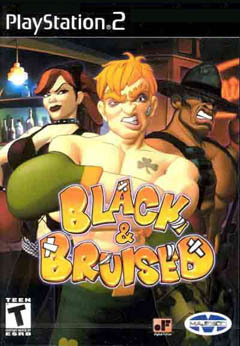 Black and Bruised is the latest boxing sensation to *HIT* the PlayStation 2 that contains some of the most highly entertaining boxing anecdotes since "Lets get Ready to Rumble" and with a great cartoon style boxing engine, it is sure to be either a big hit or miss with gamers around the world. 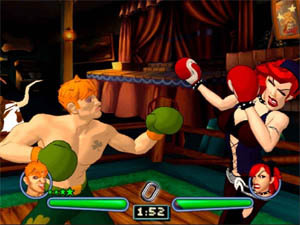 Unlike other realistic boxing games like King of Boxers, Black and Bruised takes a more entertaining approach to the sport of boxing and include a variety of loveable characters such as trailer park beauty, Knuckles Nadine (who loves to cheat) or the skinny Mexican wrestler called El Lunchador. There are fourteen boxers to choose from in Black and Bruised with another five hidden characters that must be unlocked in order for the gamer to select them. 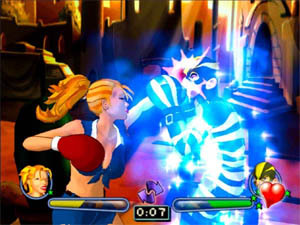 Black and Bruised contains a variety of different gameplay modes that include two-player fight, tournament, survival, training and boxer's life. 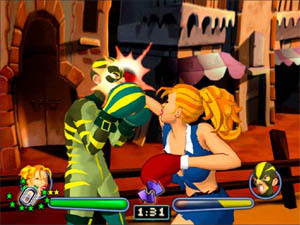 For most gamers, the main two methods of gameplay will be boxer's life and multiplayer. Boxer's life allows the player to take their other characters in various story-driven matches with a variety of cut scenes to keep things interesting that lead you to the grand finale. By completing the boxer's life gameplay, you also unlock five other mystery characters. The unfortunate aspect of Black and Bruised is that just about all the characters play the same and the only thing that separates them from each other is the way they look. The control system behind Black and Bruised is basically a button masher and there isn't too much skill involved to hit your opponent. So if you are an expert at mashing buttons together, you will easily become the World Champion in both the single player and multiplayer modes. Fortunately, there are a variety of powerups available in the game that help spruce things up such as super speed and regeneration. Graphically Black and Bruised is one of those games that doesn't fit in with the traditional genre of PS2 graphics as it uses a combination of cell-shaded graphics with cartoon animation. All the characters in the game look like something out of a Saturday morning cartoon that all have their own unique personalities and are extremely well animated. The frame rate of the game is perfect and runs at extremely high speeds, ensuring that this game is one of the smoothest games on the PlayStation 2. The developers have also done a great job at the various backgrounds where you must fight such as Mexico and Egypt that are extremely colourful and sharp. Another impressive feature of the game is that when you hit a boxer, you can actually see the visible bruising that you leave on their face. The sound effects of Black and Bruised is first class and all the boxers have their own personal taunts that really helps add to the atmosphere of the game. The character acting, although extremely cheesy is perfectly suited for this game and the developers use just about every type of stereotype available in the world to bring into this game. The various sounds of boxing such as punches and the sounds of fists hitting bodies sound extremely cartoon as does the soundtrack of Black and Bruised. Both perfectly suited to the game. In conclusion Black and Bruised is a "fun" game that doesn't try to take itself too seriously, I would recommend this game to the younger generation of gamers as it appears to ideally suited to them. With some great graphics and sound effects, the only downside to Black and Bruised is the limited playability, but fortunately the game makes up for it in other ways. Check it out!